Samsung to launch a refurbished variant of the ill-fated Galaxy Note 7 in South Korea through three carriers at the end of June. It’s believed that 300,000 of the recalled three-to-four million units will go on sale in the region, and will sport a new 3,200mAh battery instead of the 3,500mAh cell found on board its predecessor. The handset will be called the Galaxy Note 7 R (SM-N935) and will carry a price tag of around 700,000 won ($620), approximately 300,000 won ($266) less than the original Galaxy Note 7, which was priced at 989,890 won ($878) when it hit the shelves back in September 2016. 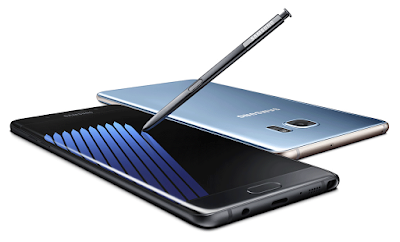 Galaxy Note 7 has a 5.7-inch Quad HD (2560×1440 pixels) Super AMOLED curved edge display with an always-on feature which was first introduced in Galaxy S7. Powered by an Exynos Octa-core 8890 processor coupled with 4GB of RAM and 64GB of internal storage which is further expandable with MicroSD card up to 256GB. On camera, it has a 12-megapixel rear camera with LED flash, OIS,f/1.7 aperture and a 5-megapixel front-facing camera. The Dual Pixel rear camera promises brighter and sharper images, even in low light. It has hybrid dual SIM support that lets you use the second slot as an expansion slot when required. In addition to a fingerprint scanner, Samsung has added an Iris scanner for the first time that would let you unlock the phone using eye recognition.